My family's been requesting this bread for months. I finally got around to it when I found myself with leftover pumpkin after making pumpkin pizza dough. In all fairness, pumpkin was a bit difficult to come by in late summer. I’m not a total slacker, just a partial one. If you look closely at the picture you’ll see a frog monster shape in the little bowl of maple butter. Sometimes fun things like this happen when shooting food. It reminds me of 1970s Better Homes and Gardens cookbooks with all the pointless figurines stuffed around plates of food. James Lileks has deposited many scary crazy food pictures from that era into his books, “The Gallery of Regrettable Food” and “Gastroanomalies”. I tend to read them in the middle of the night when insomnia hits. I try not to wake up Jesse, but it starts with a little snort, then a few giggles, and soon I begin to laugh so loud I startle him awake. Lileks’ books are also great to hand around the room at parties. They get people talking about all the crazy nasty food they’ve come across in their lives. That’s my kinda fun anyway! 1. Preheat the oven to 350 degrees. Lightly butter and flour two 9x5 inch Pyrex loaf pans. Tap off excess flour from the pans. 2. In a stand mixer, beat together the sugar, oil, orange zest, and vanilla extract on medium speed for 1 minute. Add the eggs and beat until combined. Add the pumpkin and mix until combined. Next, add the salt, cinnamon, cloves, nutmeg, ginger, baking powder, and soda and mix until combined. Then add the flour and mix on low speed until just combined. 3. Divide the batter equally among the two pans. Smooth the surface slightly and then tap the pans on the counter to release any air bubbles. 4. Bake for 60 to 65 minutes or until a toothpick inserted into the center comes out clean. 5. Let the bread cool for 10 minutes in their pans on a cooling rack. Then jiggle to loosen and gently unmold onto parchment or wax paper. Move to a cooling rack to finish cooling. 1. Once cooled, the extra loaf can be wrapped in foil and frozen. 2. Cooking time may need to be adjusted for metal loaf pans. You crack me up! Will definitely be checking out those sites. I love the old cookbook pics from the 50s and 60s. I also love your frog faced maple butter. It all looks so delicious! aspettami domani per colazione!!!! mmmm....buonissimo! Thanks to commenter Jamie who helped me find the frog monster... I was looking for a green plastic toy somewhere. Oy! Anyway, I love your bread, really love the photos too. I'm going to try your maple butter. I love to make honey butter in a similar fashion. 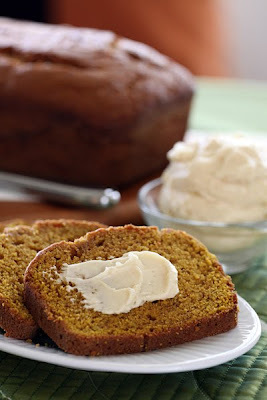 Maple Butter with an orange-y pumpkin bread, that is SO the way to eat, perfect! We think your photos are absolutely mouthwatering...and we'd love to showcase them on Foodie Views of the Day!!! Foodie Views of the Day is a delicious feature on our website, FoodieView (www.foodieview.com). The idea is to provide fabulous foodies like yourself with an alternative space to share your food photo talents--and to give your readers and our users an opportunity to vote on their favorite pics. You can check it out here: http://www.foodieview.com/views/. You can upload your visual displays of yumminess directly to the site by following this link: http://www.foodieview.com/views/submit_info.jsp. All photos posted on Foodie Views of the Day are coupled with the appropriate photo credit and a link to the corresponding post on your blog. You can also add one of our fancy blog buttons to your site--which makes it easy for your fans to vote on your pics. As always...great pictures and delicious food. Laura, I am so happy that you can share your talent with al of us. I can't wait for you to have a cooking book, please include the vespa somewhere!!! By the way some girl in a blog copied your candy corn cookie idea and of course didn't give you credit. Wrong choice! I left a comment on her blog that she will remember forever! The bread sounds delicious and with maple butter?? Over the top. I can think of a LOT of things I would love maple butter on. You had me at pumpkin, and orange zest and maple butter. This combination seems unreal. I am currently on the hunt for some amazing pumpkin recipes, I think this one is a winner. Frog Monster... Laura, you are too funny! The bread, with THAT spread, irresistible. I adore the combination of flavors. Nice job. What a marvelous combination of ingredients. This must be delicious. Thanks to Jamie I was also able to see the frog. YUMMY! This is exactly what I need after cooking up all our halloween pumpkins. I have a huge bowl of pumpkin to use up. Thank you! Thanks for the compliment and coming over...I like the frog monster, must be the artist in us to notice, otherwise I believe no one would notice! Baking ahead and freezing some stuff right now for the holidays and this will be perfect! This is the best ever pumpkin bread! Thank you!! Thank-you so much for telling me!! That made me really happy.